how do you count the legs on a millipede? Ignore the first four trunk segments then count the others and multiply by 2. Three villages in north-west Scotland had to impose a wartime-style “blackout” in 2008 to help repel an invasion force of thousands of inch-long black millipedes attracted by light,. 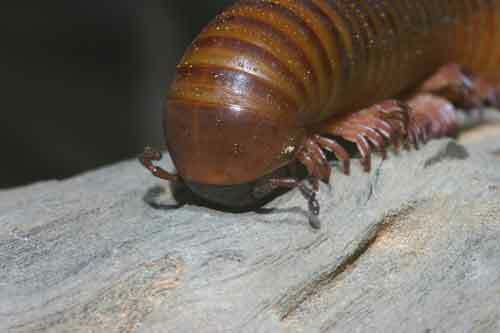 The female millipede can lay up to 1,000 eggs at once although the number is usually closer to 500. When baby millipedes hatch they only have 3 pairs of legs. Each time they molt they develop more body segments and legs. Some species emit hydrogen cyanide gas through microscopic pores along the sides of their bodies as a secondary defence. The millipede is the oldest myriapod in the fossil record, and possibly the oldest known terrestrial oxygen-breathing organism. The oldest known millipede fossil species is Pneumodesmus newmani from the mid Silurian dating to about 425 million years ago.